I’ve been thinking a lot about Baby Bubbles Nursery. With A it was so simple because I knew exactly what I wanted for her room and J was a fan of my plans from the get-go. Things couldn’t be more different this time around. For the longest time I scoured the internet looking for inspiration and I just couldn’t figure out what I wanted for my second sweet gal’s room. Because lets be honest, when they’re babies it’s about what the parents want. Babies don’t care how their room looks. So I figured this would be my chance to decorate her room the way I want it before she gets old enough to request all that terrible character nonsense which I’ll happily oblige within reason and budget (It’s really not terrible, of course. It’s just not my first choice in decorating a room). If Bubbles had been a boy, I was totally set on a Lumber Jack nursery (not super whimsical or woodsy, but a lot more modern with bright pops of unexpected colors, much like this). I showed it to J and to say he wasn’t on board is an understatement. I don’t know what it was, but he couldn’t stand it! It because a friendly battle of wills, and being as snarky as I am, I couldn’t help threatening J with a Lumbersexual nursery if we had a boy (and no, I’m not sexualizing babies, it’s more a joke poking fun at this popular, made-up term). Luckily for him, we are having another girl. So it was back to drawing board for me. Not that I minded, it’s fun looking at nursery ideas and there are a ton of cute baby room ideas out there, especially for little girls. But the fact that I could couldn’t pinpoint exactly what I wanted this time around stressed me out a bit because I’m a planner by nature and would prefer to have everything in place before she arrives. So I started looking over my nursery pins and I noticed some trends. Clean and fresh, neutral rooms with fun pops of color. Nothing too baby-ish (while themes can be cute, I’m not the type to go out and get the full bedding/room set). I really wanted a space that Bubbles could grow into. I’d call the vibe relaxed Californian with a pinch of bohemian thrown in. 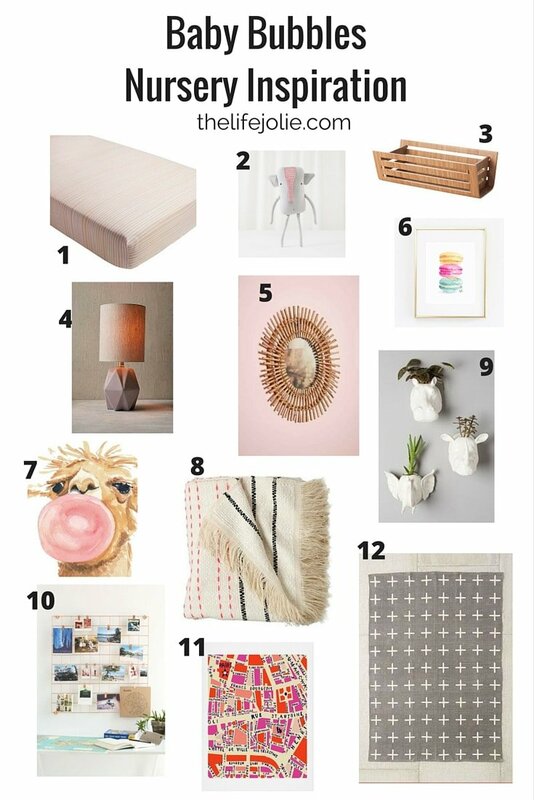 Where do you like to look for cute home decor? December 11, 2015 at 5:28 pm Oh my goodness, great finds! They do look good together (maybe the rug is underpowered but all else are fantastic). Pretty and elegant combo. TwoPlusCute recently posted...Hello, US embassy? We have an emergency! December 15, 2015 at 4:45 pm Thank you! I've had the worst time finding a rug. I was thinking of going more neutral to let the attention be on the more colorful aspects of the room but I don't know.